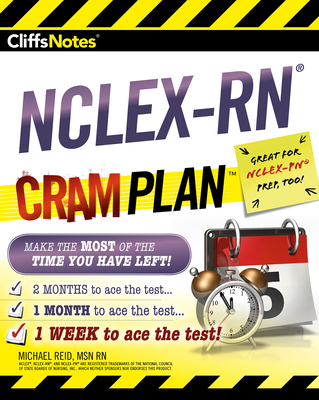 CliffsNotes NCLEX Cram Plan is the perfect way to review for your RN or PN nursing exam whether you have two months, one month, or even one week left to prepare! CliffsNotes NCLEX-RN Cram Plan uses calendars to create a specific study plan for test-takers depending on how much time they have left before they take the test. Also included is a specialized NCLEX-PN study plan, meaning that NCLEX-PN test-takers can use this book to pass their nursing exam, too! The NCLEX-RN test is taken by individuals who want to become a registered nurse; the NCLEX-PN test is taken by those who want to become a practical nurse. Administered by appointment year round, more than 230,000 candidates take the NCLEX-RN test annually, and almost 65,000 candidates take the NCLEX-PN. The average passing rate for each test is only 70%. Michael Reid, MSN, RN, CCRN, is the founder and director of an NCLEX® test-prep company (The NCLEX Cure) specializing in individuals who are looking to pass the NCLEX® exam and become registered or practical nurses. Michael has worked for prestigious hospitals such as The Johns Hopkins Hospital and Northwestern Memorial Hospital. He currently works as a critical care nurse in a Chicago hospital ICU, in addition to teaching students from across the United States and abroad.